The way to a person’s heart, they say, is through their stomach, no wonder Valentine’s Day is one of the busiest nights for restaurants. 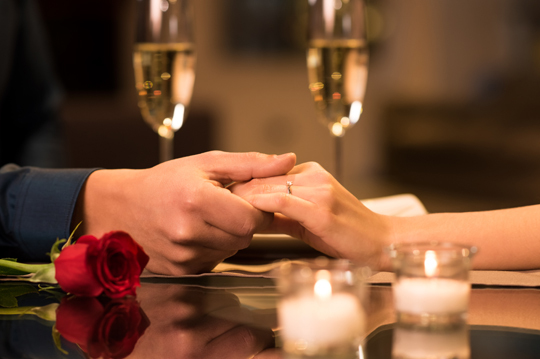 Express your love and adoration to your significant other with a romantic date night complete with candles, flowers, and luscious dishes that can only be made with love. 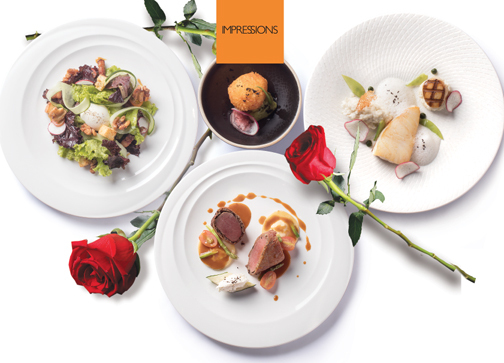 Impressions serves a special Valentine’s Day multi-course dinner menu. Can’t go to Paris? Bring the City of Lights to your love with a French fine dining at award-winning restaurant Impressions in Resorts World Manila. The Impressions Dine in Love prix fixe menu starts off light and frothy with an amuse bouche of Crab Meat Croquet with avocados and cherry syrup. The appetizer of Candied Walnuts with 62-degree Egg is served with crispy lardons, mixed greens, and mustard dressing, followed by a comforting bowl of Potato and Green Tea Soup with steamed tofu and croutons. For the entrée, couples can savor Impressions’ signature Pan-Seared Chilean Sea Bass and Grilled Scallops served with spinach puree, cauliflower risotto, sea urchin foam, and tomato Tuile. Take your significant other on a gustatory adventure to Paris at Impressions. The light flavors of the entrée are the perfect build-up to the main entrée of Prosciutto-Wrapped Australian Lamb Loin which comes with ravioli of lamb ragout, sautéed asparagus, cherry tomatoes, goat cheese mousse, stuffed zucchini, and honey pear jus. The mignardises course is a trio of bite sized treats of Red Berries Macaron, Tequila Rose Praline, and Cherry and Vanilla Cream Puff. The final flourish of this decadent dinner is a Citrus Panna Cotta with Strawberry Puree that delivers an exhilarating burst of tartness that offsets the silky textures and rich sweetness of the classic dessert. This special meal is available on the evening of Feb. 14 for P3,500++ per person. Go to www.rwmanila.com or call (02) 908-8833 for inquiries and reservations. Lovelorn couples and lovers of Japanese food are set to experience a memorable Valentine season with Kitsho Restaurant’s special set menu. Executive chef Keita Kamimoto whips up a special set menu for lovers on Valentine’s Day. Executive chef Keita Kamimoto’s Valentine set menu starts with the delectable tuna sweet and spicy salad, to be followed by the savory fish sake soup made of white fish ushio and fish ball kamaboko spinach mitsuba. The main course will feature the Hamatchi (yellow tail) katsu dish. The romantic meal is capped off with the perfectly crafted Buttercream cake. In addition, the set meal comes with a complimentary glass of red or white wine or beer for each of the dining couple. The special Valentine set menu is offered at P1,960 (for two), inclusive of VAT and service charge. Call (02) 994-3623 for inquiries and reservations. Cafe+Bar presents a smorgasbord of international fare, from ribeye to lamb to an assortment of chocolates. Eastwood Richmonde Hotel’s Eastwood Café+Bar celebrates love with “L’amour,” a Valentine’s Day dinner feast filled with delectable dishes on Feb. 14, from 6:00 p.m. to 9:00 p.m. The Valentine’s dinner buffet features a lavish spread of mouthwatering international fare highlighted by favorite carvings—US ribeye, Australian leg of lamb, US turkey, and Chilean salmon, complemented by the Paella Valenciana and Paella Negra, plus various sidings. The antipasti station is chockfull of cold cuts, cheese, chorizo, olives, grapes, artichoke, and munchies like walnuts, almonds, dried apricots, crackers, and bread sticks. Completing the pre-entrée items are the salad bar and soup station. Valentine’s Day won’t be Valentine’s Day without chocolates. The feast’s pièce de résistance can be found at the dessert counter where an assortment of chocolate confectioneries is showcased, from candies to cakes and pastries. A pianist provides the diners with live musical entertainment. 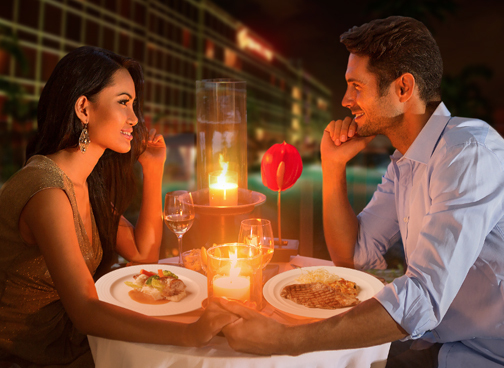 The Valentine’s dinner buffet is priced at P1,750 nett per person and comes with bottomless flavored mimosa. Children 10 years old and below get 50 percent discount and a toy. Call (02) 570-7777 for inquiries and reservations. Alfred in Makati Diamond Residences is serving a special dinner buffet menu on the evening of Feb. 14. Fine dining restaurant Alfred in Makati Diamond Residences is serving a special dinner buffet menu that includes a fondue and gravlax station on the evening of Valentine’s Day. The buffet spread will feature Roasted Angus Ribeye, Lamb Leg with Rosemary Au Jus, Prawn with Herb de Provence, Pinakbet Rice with Crispy Bagnet Strips, and other appetizers. For dessert, there will be Strawberry Shortcake, Rosewater Macarons, and Earl Grey Raspberry. The dinner buffet is priced at P2,000 nett per person. Call (02) 317-0999 local 1114 for inquiries and reservations.